Hate crimes are offences that are motivated by hostility, or where some form of demonstration of hostility is made, against the victim’s identity. Such crimes can have devastating impacts, both on those directly victimised and on other community members who fear they too may be targeted. While much has been written about the impacts of hate crime victimisation, there has been little which has focused on how the criminal justice system can effectively address the consequences of hate — other than through criminalising and punishing offenders. A relatively new theory and practice of criminal justice is that of “Restorative Justice” (RJ). RJ seeks to bring the “stakeholders” of an offence together via inclusive dialogue in order to explore what has happened, why it happened, and how best those involved in the offence can repair the harms caused. There is now a substantial body of research into the effectiveness of RJ for violent and non-violent offences. Yet there has been little attention paid to whether such a process can effectively address crimes motivated by identity-based prejudice. The harms caused by prejudice-motivated crime can relate both to the individual traumas experienced by victims, and the structural harms faced by many marginalised communities. The individual and structural harms caused by hate crime are not easily remedied. The current approach to combating hate crime via criminalisation and enhanced penalties, while important symbolically to the combatting of hate crime, does little to directly repair harm or challenge the underlying causes of hate-motivated offending. In order to understand more about the reparative qualities of Restorative Justice for hate crime an empirical study of RJ projects was conducted where practices were used to address the causes and consequences of hate crime offences. The 18 month project involved 60 qualitative interviews with victims, restorative practitioners, and police officers who had participated in a restorative practice. In addition, 18 RJ meetings were observed, many of which involved face-to-face dialogue between victim, offender, and their supporters. One such project, administered by the Hate Crimes Project at Southwark Mediation Centre, South London, used a central restorative practice called Community Mediation, which employs a victim-offender or family group conferencing model. The cases researched involved “low-level” offences (including crimes aggravated by racial, religious, sexual orientation, and disability hostility) such as causing harassment, violence, or common assault, as well as more serious forms of violence including several cases of actual bodily harm and grievous bodily harm. In the Southwark Hate Crimes Project, the majority of complainant victims (17/23) interviewed stated that the mediation process directly improved their emotional well-being. Further exploration of the process found that the levels of anger, anxiety, and fear that were experienced by almost all victims were reduced directly after the mediation process. Victims spoke at length about why the dialogical process used during mediation helped to improve their emotional well-being. First and foremost, participants felt they could play an active role in their own conflict resolution. This was especially important to most victims who felt that they had previously been ignored by state agencies when reporting their experiences of victimisation. Many noted that they were finally being listened to and their victimisation was now being taken seriously. It was of utmost importance to victims that the perpetrator signed an agreement promising to desist from further hate incidents. In terms of desistance, 11 out of 19 separate cases of ongoing hate crime incidents researched in Southwark ceased directly after the mediation process had taken place (participants were interviewed at least six months after the mediation process ended). In a further six cases incidents stopped after the community mediator included other agencies within the mediation process, including schools, social services, and community police officers. Unfortunately, the positive findings reported from Southwark were not repeated for the restorative policing measures used for low-level offences by Devon and Cornwall Police. Just half of the 14 interviewees stated that they were satisfied with the outcome of their case, where an alternative restorative practice, called Restorative Disposal was used. There were several reasons for lower levels of harm reparation at Devon and Cornwall, most of which were directly linked to the (lack of) restorativeness of the intervention. For example, several participants felt pressured by the police to agree to the intervention which had direct implications for the voluntariness of the process – a key tenet of restorative justice theory and practice. Collectively, these results suggested that where restorative justice is implemented by experienced practitioners committed to the values of “encounter,” “repair,” and “transformation” it could reduce some of the harms caused by hate. However, where Restorative Justice was done “on the quick” by facilitators who were not equipped with either the time or resources to administer RJ properly, victims will be left without adequate reparation for the harms they have endured. Another key factor supporting the reparative qualities of restorative practice, is reconceptualising the central notion of “community”. It is important to understand the complex dynamics of “community” by recognising that it may have certain invidious qualities (that are causal to hate-motivated offences) as well as more benevolent virtues. Equally, “community” may provide a crucial conduit through which moral learning about “difference” can be supported and offenders can be reintegrated into neighbourhoods less likely to reoffend. Although the notion of community is an elusive concept, it is important for the future use of restorative practices for practitioners to view community organisations as important components of local neighbourhoods. These organisations (including neighbourhood policing teams, housing associations, schools, colleges, and social services) have an important role to play in conflict resolution, and must work together using a multi-agency approach to addressing hate crime. Such an approach, if led by a restorative practitioner, allows the various agencies involved in tackling hate victimisation to combine their efforts in order to better support victims and manage offenders. Hence, Restorative Justice may have scope to not only mitigate against the traumas of direct victimisation but also some of the structural harms that marginalised groups continue to experience. Image credit: Southwark bridge at night, by Ktulu. CC-BY-SA-3.0 via Wikimedia Commons. Dr Mark Austin Walters is a Senior Lecturer in Criminal Law and Criminal Justice at the University of Sussex, and the Co-Director of the International Network of Hate Studies. 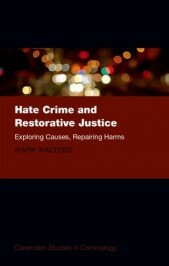 He is the author of Hate Crime and Restorative Justice: Exploring Causes and Repairing Harms, which includes a full analysis of the impacts of hate crime, the use of restorative justice, multi-agency partnerships and the importance of re-conceptualising “community” in restorative discourse in cases involving “difference”. A full text of the book’s introduction 'Readdressing Hate Crime' can be accessed online.